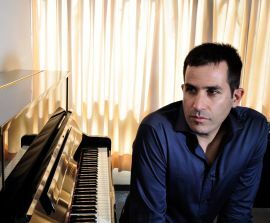 Ayal Adler is internationally active and his works are being performed worldwide. His ouvre includes music in various genres, including solo, chamber, vocal and orchestral. His orchetsral works were commissioned and performed by Daniel Barenboim and the West- Eastern DIVAN Orchestra; Zubin Mehta and the IPO, and others. His music was performed at the BBC Proms- Royal Albert Hall; Lucerne Festival; Salzburg Festival; Colon Theatre,Buenos Aires, and others. His works were commissioned by the Jerusalem International Chamber Music Festival; West- Eastern Divan Orchestra; Jerusaelm Symphony Orchetsra: Adele and John Gray Endowment Fund; Camerata Orchestra; Jerusalem Music Center, etc. His works were selected for the ISCM Festival -International Society of Contemporary Music, and ACL-Asian Compoers' League. Mr. Adler has received many awards, including the Prime Minister Composers' Awarad ; Acievement Award of the Year - an Acum (equal to Ascap) Prize, and others. He served as Composer-in-Residence for the Meitar Ensemble from 2006-2012, and later became the Ensemble's Advisor. Mr. Adler currently serves as Chair of the Composition and Conducting department at the Jerusalem Academy of Music and Dance, and also as Drector of the Israeli Composers' League. His works are regularly published by IMI ,and IMC.